Note: This article was originally published in the March 2008 issue of the Denver publication Community News. Now that we're into March, are you feeling discouraged because you haven't succeeded in keeping those familiar New Year's resolutions regarding weight loss and exercise? If so, I'm here to help! Given the importance of weight loss and improved fitness to me and so many others, I've decided to put together a longer than usual article this month and a related one next month. Together, they offer simple, sound, practical tips for weight loss and exercise. All these suggestions are aimed at improving your overall health. I am not advocating any sort of restrictive crash diet or super-strenuous exercise program. Instead, I offer these tips in the hope that they will help you achieve your personal weight loss goal by changing your habits, your lifestyle, in a multitude of healthy, achievable, and sustainable ways. It really is as simple as that. You do not need a bunch of faddish diet books that often contradict each other, high-priced or gimmicky exercise equipment, or a $75-per-hour personal trainer. To lose weight, you need to take in fewer calories (eat less) and burn more calories (move more, exercise more, sit less). Recent studies also indicate that a chronic lack of sleep helps make people fat. Try hard to get 7 or 8 hours of sleep every night. While you're changing your eating, sleeping, and exercise habits, learn to eat not just less � maybe a lot less � but also better, more healthily. Eat many more vegetables and fresh fruits. Eat mainly whole grain bread and pasta. Eat lean meat and fish in small portions. Eat fewer sweets and quit drinking soft drinks; regular soft drinks contain huge amounts of sugar, and the most common artificial sweetener in the diet ones can actually make you crave more carbohydrates. Dark colas weaken your bones, too. For snacks, try things like nuts or fresh fruit or yogurt, vs. chips or candy or microwave popcorn. Drink green or oolong tea or plain coffee from your own thermos bottle, vs. a syrupy calorie bomb from a coffee shop. Have occasional small pieces of plain dark chocolate, vs. big slabs of milk chocolate. And so on! You probably already know most of the basics; it's the implementation that's hard. So, to help you out, I'm offering numerous specific suggestions, a little new nutrition information, and a lot of encouragement. Once upon a time, maybe decades ago, you were probably reasonably slim and fit. Remember how good that felt? Then you got older and your life circumstances changed. You worked more and exercised less. Maybe you had kids. You formed bad habits and dropped good ones. Year after year, more and more pounds came on and your muscle tone and flexibility diminished. Now, today, you are not happy with how you look and feel, and you really want to change. That's great, because a sincere desire for change is the very first step. Next, you need to accept the fact that only a lasting change in your overall, longterm way of eating and exercising is going to get you the results you want. Crash diets and faddish exercise routines do not work. Good eating habits and simple, regular exercises do. So rest assured that no matter what shape you are in now, permanent weight loss and improved fitness are absolutely achievable if you make sensible changes one small step at a time. You can do this! Let your friends and family know that you are determined to lose X lbs. this year and to do some sort of exercise on a regular basis, even if it's just walking more and doing half a dozen dumbbell exercises two or three times a week. (I'll have numerous exercise specifics in next month's issue.) If you make this kind of public statement, you will feel more motivated to at least come close to those goals by year's end. Also, with luck, some of those people will congratulate you and then help you achieve your goals. Don't let anybody, even your spouse or a relative or a close friend, sabotage your efforts! Remember, it's your body and your health. If those around you do not want to take care of their own bodies, that's their concern. Let others know what you are trying to do and why, then drop the subject, unless it's to announce that you've lost another few pounds. For the record: My own goal is to lose at least 15 lbs. this year. Come next winter, I'll let you know how I did. Sure, maybe you need to lose 50 lbs. or more, and maybe you'd like to be able to bench press 200 lbs. or run a marathon. But don't set your sights too high, because doing so is a recipe for failure. And never make the mistake of comparing your own body to those of the fitness models and professional athletes in the magazines and on TV. They are not like you and me. Fitness is their paid profession, not a part-time pursuit. When losing weight, most people should aim for no more than 15 to 25 lbs. in one year. That's because the more slowly you take weight off, the more likely you are to keep it off. After all, you put on those extra pounds over many years, right? So don't expect the pounds to disappear forever in a few weeks or months. Be patient with yourself. In this case, slow and steady really does win the race. If a woman is losing more than about a pound a week, or a man is losing more than about two pounds a week, then they are most likely losing muscle mass as well as fat, and that's not good. The more muscle tissue you have in proportion to fat, the higher your resting metabolism will be. That's one of the many reasons why your exercise program should include both aerobic exercise and weight training. A strong body is also a firmer, shapelier body. What is a realistic, healthy weight to aim for? There are more complicated formulas out there, but here's an easy one. For women, starting at about 105 lbs. at 5 ft. of height, add 5 or 6 lbs. per inch of height. (Forget the awful old 1960s base line of 100 lbs. at 5 ft. of height and a mere 4 lbs. per inch above that.) That is, a 5' 5" woman should weigh roughly 130-135 lbs., and a 5' 7" woman should weigh about 140-147 lbs. Given that muscle weighs more than fat, men usually weigh a little more than women per inch of height due to their higher percentage of muscle tissue. That recommended weight can and should be adjusted up or down a little based on your basic build, how muscular you are, your age, and your own estimate of how you look and feel at a certain weight. Also, it's important to note that recent studies have shown that being a few pounds overweight (not obese) is healthier overall than being very thin. So, unless you're a professional model or ballerina, there is no real reason to aim for extreme thinness. Don't beat up on yourself or despair if you slip up once in awhile and pig out on your favorite food. That's human nature. Let yourself enjoy your occasional culinary self-indulgence, then resolve to get back on track the next day. The key is making good eating habits the norm, and high-calorie face-stuffing an occasional treat. With enough time and effort, you will find yourself actually craving more of the good stuff and less of the bad. What to do when faced with the monstrous portions of food that most restaurants serve these days? Here are several practical solutions. Especially in places like Chinese and Mexican restaurants, ask if you can share one portion with your companion. Most restaurants have no problem with that, and you will probably have plenty to eat. You'll save money as well. Eating alone? Ask for a to-go box as soon as you're served, and put half of your meal into it right away. Close that up and take it home with you. The food will most likely taste even better the next day. If you're eating alone and it isn't practical for you to take leftovers home or to your office, ask the waiter to bring you just one roll, say, or to hold the French fries. Or simply push part of the meal to one side of your plate and resolve to leave it there. That's difficult but possible. Many restaurants offer children's portions, smaller portions for seniors (usually with lower prices attached), "quick bite" selections, and other sensible selections. And individual � la carte items have been around for ages. So before you go for the giant standard portions, look carefully for other options on the menu, or ask your server. If there are no small-portion options on the menu, speak to the manager, politely suggesting that a good menu addition would be a choice of larger and smaller portions of the standard fare - with a somewhat lower price for the latter, of course. Who knows? You might start a healthy national trend! If restaurant portions have gone up in recent years, why can't they go down again if there's enough demand for that? By this I mean any food that is not highly processed: things like whole-grain bread, potatoes, yams, brown rice, oatmeal and other whole-grain cereals, whole-grain crackers such as Kashi's TLC crackers, fresh or dried fruits, fruit juices in moderation, V-8 juice (cold or hot), very diluted lemonade, fresh or frozen vegetables, soups and stews, chicken or beef broth, lean meat, eggs, fresh or canned fish, beans, barley, nuts and natural nut butters, extra virgin olive oil, hummus, and wholemilk (preferably organic) dairy products such as milk, cheese, yogurt, butter, and very little ice cream. Fruits and vegetables should be varied and colorful; the darker the color, the better. Try as hard as you can to avoid cookies, cakes, pies, doughnuts, muffins, chips, candy, and the like. At the very least, train yourself to eat only small portions of these things, and to eat them much less often. Recent research indicates that full-fat dairy products can help ovecome infertility and even help you lose weight. The milk fat helps you digest the protein. It helps the calcium get into your bones and helps Vitamins A and D get into your body. Also, it raises HDL, the good cholesterol, not LDL, the bad cholesterol. Whole milk can also help you control your appetite. Try it on your morning cereal and see how much longer it is before you're craving lunch! It's not whole milk that makes people fat; it's too much sugar, white flour, corn syrup, junk food, fried foods, large portions, and too little exercise and sleep. So please try some whole milk for a while, and see what happens. At the very least, try reduced-fat (2% fat) milk and yogurt, vs. skim or low-fat milk and yogurt. My husband and I are both having good results with our recent switch to whole milk. We're losing weight, and David's sometimes aching joints (he's 64) are hurting him less. I encourage you to do your own research on this very interesting new piece of nutrition advice. That is, make a happy game of training yourself to eat better. See how many "tricks" you can come up with to eat better and less. Here are some for you to try. Eat from smaller plates and bowls, and make those blue, not orange or red; blue helps diminish appetite, and orange or red stimulates it. (Ever notice how many restaurants use red and orange in their decorating schemes?) If you don't want to buy blue dishes, at least use white dishes on a blue tablecloth or placemat. If your family insists on big dishes, buy one smaller place setting for yourself, or just use the smallest dishes you already own. Use smaller cutlery, too, such as salad forks and teaspoons; those will make you eat more slowly. Reduce your appetite before a meal by drinking a cup of hot water with ¼ teaspoon of honey in it. Make that locally produced honey if possible. Honey from your own area, such as the Clark's Colorado wildflower honey that we buy, can help you build immunity to local pollens. However, very young children should not be fed raw honey, so be careful with that. Try not to eat standing up. Sit down, eat slowly, and chew each bite thoroughly. Take a healthy lunch with you to work, rather than eating out. We eat turkey or ham sandwiches and a variety of cut-up raw vegetables and fresh and dried fruits, all packed in plastic sandwich containers. Try not to eat while watching TV. If you must, eat small portions of nutritious food. Fresh fruit is best. Costco sells large packages of very fresh fruit for amazingly low prices. We are now enjoying things like fresh cherries, blueberries, and strawberries in the dead of winter. We eat red and purple grapes every day. Costco also sells big bags of organic frozen fruits. These can be very practical if you live alone, as any unused portion stays nutritious and tasty for a long time. If you are craving some snack food like nuts or crackers, do NOT make the mistake of standing next to the container and dipping your hand into it over and over while you read or talk to someone. Instead, measure out a small, sensible portion, then close up the box or jar and put it away. Add some lean turkey to your diet. Those little pre-roasted turkey breasts from the supermarket are great. We like the Kentucky Legend brand from King Sooper. If you simply must have cookies, and a serving size is listed as two or three cookies, have just one. In general, try to allow yourself no more than one very small serving of something sweet per day. Chocolate is actually good for you in moderation, but switch to plain dark chocolate (50% cocoa or more). You'll probably crave it less than milk chocolate. If you find yourself strongly tempted by dessert even after a large restaurant meal, try bringing with you one of those red-wrapped Dove dark chocolate pieces (about 42 calories each) or one small cookie in plastic wrap, such as a single Chips Ahoy cookie (about 53 calories). Enjoy your mini dessert with a cup of coffee or tea while others pig out, and you'll be fine. Do you just have to have some crunchy snacks? Go for those little 100-calorie snack packs, and never eat more than one pack per day. 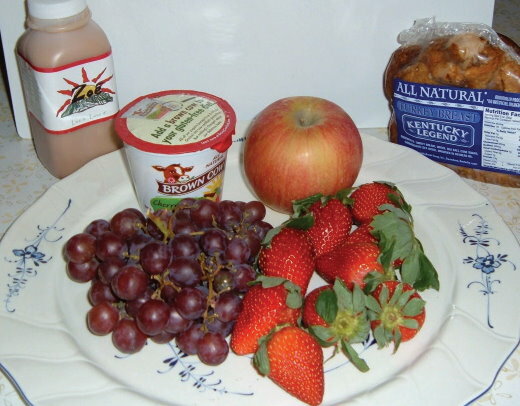 Better yet, have five prunes, an apple, a piece of cheese, or a handful of almonds for a total of about 100 calories. If you love both pears and apples, try Asian pears, which are somewhat like a cross between the two fruits. They are juicy, crunchy heaven. Try lots of green tea and oolong (wu-long) tea to help you lose weight. 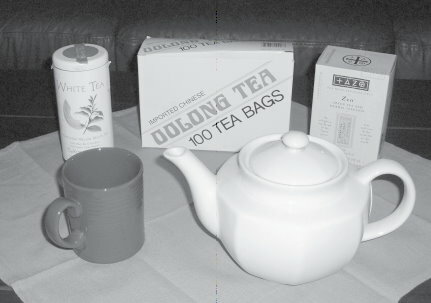 Buy teas in Asian markets for the lowest prices, usually under $5 for 100 bags. Don't fall for online ads and inflated prices. Some old but sound advice is to drink a cup of hot chicken broth or beef broth before a meal to help reduce your appetite. We like the organic Pacific brand chicken broth from Vitamin Cottage or Costco. Mix up a can of regular frozen lemonade, such as Minute Maid, but when you serve it, first fill each glass at least half full of plain, cold sparkling water. This is a very refreshing mixture! Kroger Big K Lemon Lime Sparkling Water, at King Sooper, is very inexpensive. Zoe Juice, made from organic Colorado peaches and apples with whey protein isolate and a little honey added, makes a great fat-free, on-the-go meal replacement, or a healthy day-long snack if you just sip from the bottle throughout the day. It's also good pre- or post-workout fuel. See www.zoejuice.com for ordering details. A 12-oz. bottle has 310 calories. A little lemon juice on your salad or other vegetables can help decrease the amount of fat your body absorbs. Try liquid stevia if you don't trust artificial sweeteners; two or three drops sweeten a whole mug of coffee or tea. 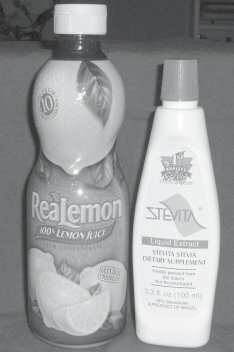 I recommend Stevita brand for its easy-to-use container. That's in the health food store. But it's best of all to try to train yourself to eat fewer sweets of all kinds. Rhodiola rosea and fucoxanthin, both at Vitamin Cottage, are two amazing supplements you might want to try. Both can help you lose weight safely without any jitters, and rhodiola also improves memory, mood, and concentration. One article I read called it "the anti-aging supplement of the 21st century."